Chandigarh: Bharti Enterprises’ Rakesh Bharti Mittal has offered to take up more schools in Punjab to further boost quality education, while seeking an opportunity to set up a food processing plant at Ladhowal, Ludhiana. Encouraged by the industry-friendly environment enabled by the new government in the state, Mittal has also sought permission for setting up the food processing plant for its Del Monte brand, at an initial investment of Rs 30 crore, with another 50 crore to be invested on completion. Seeking the Punjab government’s continued support to ensure that the company’s CSR initiative –the Satya Bharti School programme, Mittal said that he hoped to make an even bigger impact on the lives of students in the state by expanding its ambit. 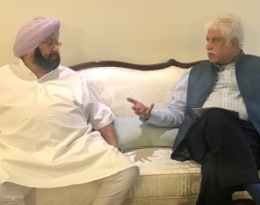 He also proposed setting up a university with a social cause to provide quality higher education to the deserving underprivileged students of Punjab. At a meeting with Punjab Chief Minister Captain Amarinder Singh here last evening, Mittal expressed gratitude to the Punjab Education Development Board for supporting the initiative, which had helped rural students in achieving academic excellence along with skill development, according to an official spokesperson. Students of the five Satya Bharti Adarsh Senior Secondary schools in Punjab had shown outstanding performance in Class X and XII CBSE examinations, Mittal pointed out, adding that a total of 313 students from all the five schools appeared for the exams and reported a pass percentage of 97 per cent, with eight students reporting a perfect 10 CGPA and 37 scoring in A1 Grade. “Many of these students were first generation learners and had come from humble backgrounds,” he further revealed.